A history of all activities in your Kanbanize account is kept in the Notifications panel. To open All Activities -> go to Notifications at the top right of your screen -> click on See all notifications. In the All Activities panel you can view all activities which have occurred in the account. The panel allows you to filter your data and make a specific search based criteria such as: time; users; boards; notification type. Note: Please, open the image below in a new tab to see the details we have described better. 1. Date: You can choose a certain day or set a date range. Click on the date field and select a date from calendar picker. 2. Author: You can select All users or perform a search for a single user - use the dropdown list to define it. 3. Board name: You can choose All boards or a certain board. 4. Notification Type: You can choose between: All, Transitions, Updates, Comments, Blocks, Deleted, Reached limit, exceeded limit. 6. Only my subscriptions: Using this option, the system will show you only activities you are subscribed to receive notifications for. Set your search criteria and click on the Search button. 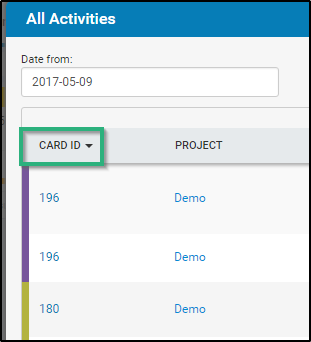 In the results you can find information on the card IDs, project and board, title of the card, notification type, details of the activity (what a change has been made), author of the activity, date, event (what is the activity), the assignee of the card and an action:delete (here you can undelete a card). If you click on the column name, you can sort the results alphabetically or numerically in descending or ascending order. You can increase the results per page by clicking on the number in the bottom left corner of the All Activities panel. You can download the results in an xlsx or the xls format by the download option in the bottom right corner of the All Activities panel. Choose to export the results from the current page or all pages -> chose xlsx or xls format -> click on Download in Excel. Tip: In the Notifications -> All Activities you can check the activity of a user in the account. Just set a date range and select as author the username, all boards and all notification types.